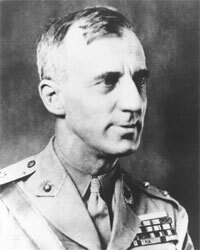 Was approached in the summer of 1933 by plotters from the Morgan Bank planning a coup d'etat against Franklin D. Roosevelt. Bond trader Gerald MacGuire spoke on behalf of financiers Grayson Murphy, Robert Sterling Clark, and six other men. He attempted to lure Butler into their traitorous scheme: march 500,000 veterans on the capitol and forcibly seize FDR. Butler demurred and revealed the story at public Congressional hearings in 1934. His story was corroborated by Veterans of Foreign Wars commander James E. Van Zandt, who testified that he also had been approached to lead the 500,000-man march on Washington. Son: Smedley Darlington Butler, Jr.